From the very earliest days of television, one of the goals of people working in the medium was to make viewers feel like a part of a larger community. The earliest television shows were essentially filmed stage presentations for a variety of reasons—most specifically because that’s what the people in the New York City theatre world where TV turned to get most of its talent knew how to do. They were expert at putting on live shows, so that meant that television naturally began to evolve toward a long series of shows filmed before audiences. Comedies, of course, benefited from having the audience there to laugh, thereby simulating what it felt like to see a funny one-act play (which most of the early sitcoms resembled) in an audience. But dramas also featured audiences. Game shows featured audiences. Variety shows featured audiences. Hell, even the commercials sometimes featured audiences. The thing about watching TV is that it’s easy to slip down into its world, but it’s also possible to have that world constantly reinforce that you’re all alone, sitting in your chair, having just plowed through five straight episodes of No Ordinary Family that were backing up on your DVR. (In my house, we call this “Saturday.”) It’s easy to laugh about shows that invite viewers to interact with the show on the Web site or Tweet about the show or what have you, but all those shows are trying to make you do is slip back into the cocoon, not feel so alone for a while. If you can stick your head out a virtual window and shout for a while at your virtual neighbors about your favorite show, maybe you can stick out another five or six episodes. Television needs to make you feel like a part of something bigger, or it becomes offputting after too much of it. It can be an incredibly lonely medium, without the sense that there’s a world behind the screen, a world you could step into. The reason for Oprah Winfrey’s titanic success as a talk show host, the reason she’s at a level of fame that’s really only approachable by a handful of other people worldwide, is the simple fact that she makes everything feel like a reason to step into her house. This week, Oprah’s been in Australia, for no particular reason, and the episode I screened involved several moments that were, essentially, Australian celebrities stopping by to show Oprah slides of their favorite Australia locations and moments. There are nods to the fact that all of this is happening on TV, that things need to be slightly outsized, as when Hugh Jackman comes down to the main stage via zip line (mildly injuring himself in the process), but the majority of what happens here is meant to make us feel like we’re among friends. If you’re not a true believer in Oprah, if you don’t step into her television home with her every day, the show really has no place for you. In its final, victory lap season, The Oprah Winfrey Show has become an exercise in making a TV show almost entirely for the people who have stuck with it every day for 25 years. Others can come along for the ride, but they need not apply. This creates a unique challenge for someone trying to break into the world of Oprah from the outside. I’ve, obviously, seen The Oprah Winfrey Show a few times over the years, but I’ve even more obviously never been the show’s target audience. Where it would be easy to read the show’s shift from a more typical, issues-oriented talk show to a show where we pretty much just listen to whatever Oprah’s telling us as a sort of extreme narcissism on the host’s part, I think it’s a stroke of genius. Oprah’s greatest skill is that she somehow has the ability to treat the television camera—and, by proxy, us—like her greatest friend in the whole, wide world. She’s open and honest, almost to a fault, and while that leads to easy-to-make-fun-of things like an 18 minute, 15 second answer at the TCA press tour, it also leads to a show that feels at once immense and personable. It’s a huge, huge show that feels almost completely constructed at a human scale. Take the final night of Oprah’s Australian adventure. The structure of the episode became predictable soon enough. Oprah would talk for a bit, then she’d be joined by a celebrity guest. The audience would scream. Oprah would encourage this screaming. The series has been criticized for the length of time it allows audience reaction to go on, but I think this is also key to its strength: Without the lengthy shouts of excitement at the mere presence of Bono in the room, the excitement wouldn’t translate out to viewers at home. By holding on long series of shots of audience members dancing about, the show manages to BUILD excitement, where it might seem like that excitement was being sapped. These are people just like you, and they’re excited. What’s more, our gracious host is almost as excited, meaning it’s OK to get this worked up. You’re in the audience! You’re having fun! Throughout it all, Oprah never forgets the people who’ve made her famous. She’s always throwing to her biggest fans, the sorts of women who’ve stuck with the show through its 25 years on the air, as the natural “housewife” audience of daytime talk shows increasingly stepped out into the workforce and DVR’ed the show for later. She brought along a coterie of her biggest fans to Australia, sending them out on a series of wacky adventures (one of which culminated in the aforementioned U2 show), and she turned an astonishing amount of screentime over to watching the women wander about the Outback. Similarly, a lengthy package focused on a huge Oprah fan who lives way out in the Australian sticks, someone whose greatest dream would be to chill with the woman herself, someone who gets to realize that dream. The audience is global. The community you’re a part of, out there in your living room, where the shadows are growing long and the sounds of evening are starting to settle in, is one filled with people just like you, people who like this show as much as you, people who live, literally, all over the world. Connection in an instant. Except it’s not. It’s easy to criticize Oprah Winfrey at this point in her career. There’s a tendency for her to make everything on the show all about her. Her constant need for an audience often shoots the smaller, more human moments I talked about above in the foot. Her love of ooey-gooey, New-Age-y type stuff can be slightly embarrassing. (Though there was none of that in this episode; instead, everybody got excited about diamonds!) And she has a bad habit of taking big, interesting topics and reducing them to bullet points, to easily televised bits and pieces that only rarely get at the depths of the subjects she tackles. Oprah’s audience is so huge and diverse that it’s sometimes easy to wish she did more, to wish she didn’t settle for the easy, pat answers. The need to create that faux connection between the audience and the host, between the guests and the people out there at home, subsumes everything else. And while it can be thrilling in the moment, it’s also a lie, a distraction designed to keep you watching. 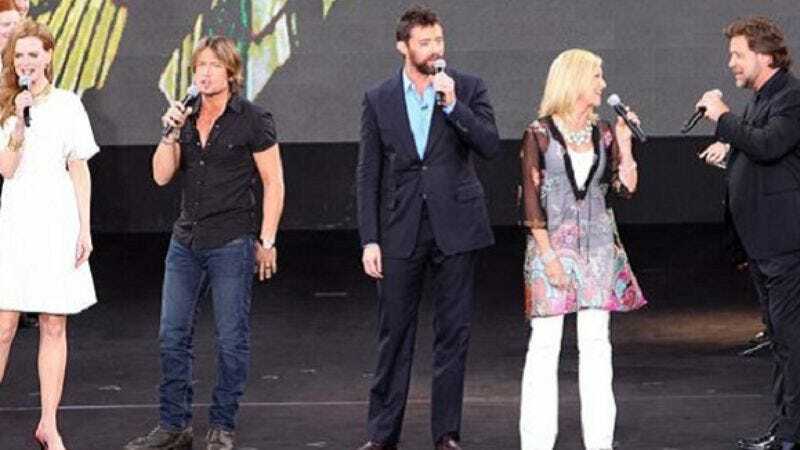 Today’s episode ended, somewhat bizarrely, with Jackman, Urban, Kidman, Olivia Newton-John, and Russell Crowe (of all people) singing “I Still Call Australia Home,” as a special gift to Oprah on the occasion of her leaving at the end of her week. While Oprah obviously had to know some of this was coming, she seemed genuinely touched, joining the stars onstage to sing with them after a while. (The sight of the five stars singing with Oprah was one of the more gleefully baffling TV images I’ve seen in quite a while.) It was a big, stirring, goofily entertaining moment, the kind of television moment only Oprah’s really still capable of, but it was also almost completely and undeniably not for someone cynical or sarcastic or unable to wholly give themselves over to something like this. Someone, I guess, like me. There’s a flipside to trying to make all of television feel like a piece of community building, and that’s the fact that if someone can’t feel like a part of that global audience, the show can feel ever more isolating. We’re watching. We’re a part of the audience. But not really. And here you are, and it’s another day over, and that’s all there is. I get why Oprah’s so popular. I really respect her as a talent and as a TV host. I think I see what her audience sees in her show. But every time I check the show out, I can’t help but feel like this is a world I’m not a part of and can never be a part of. And that’s fine. It is what it is, and I am who I am. But where a true fan might leave the show feeling energized, I just leave it wanting to turn off the TV and find somebody out there in the real world, somebody I can actually talk to.